Australian scientists have managed to crack the code of a mysterious 3,700-year-old Babylonian clay tablet, revealing a level of mathematical sophistication that pre-dates the ancient Greeks by a whopping 1,500 years. 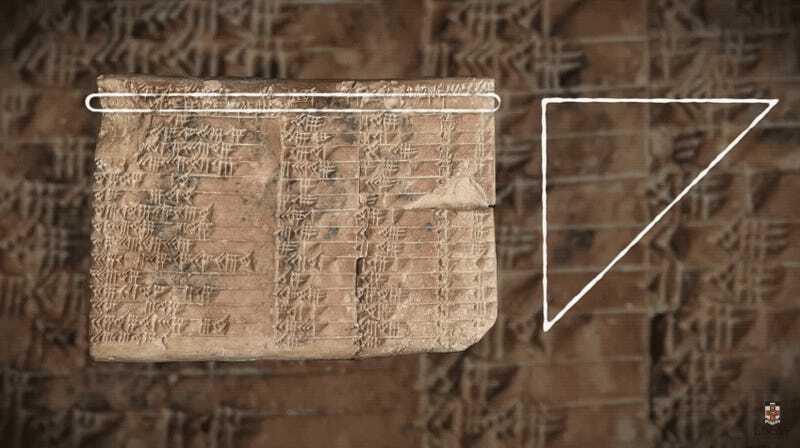 This Babylonian tablet, known as Plimpton 322, is the world’s oldest—and most accurate—trigonometric table, according to research published this week in Historia Mathematica. The University of New South Wales Sydney researchers who cracked the code say the tablet was likely used by mathematical scribes to calculate angles when designing palaces, temples, step pyramids, and canals. This discovery shows that the ancient Babylonians—and not the Greeks—were the first to study trigonometry, the mathematical study of triangles. Plimpton 322 was discovered in the early 1900s in southern Iraq by famed archaeologist Edgar Banks, who would go on to be the inspiration for Indiana Jones. Dated to between 1822 and 1762 BC, the tablet likely originated in the ancient Sumerian city of Larsa. Analysis of the tablet showed that the ancient Babylonians knew about the Pythagorian Theorem long before the rise of ancient Greece, but the tablet’s exact purpose remained a mystery. One of the stronger theories was that it was a teaching aid for checking quadratic problems, but new research conducted by UNSW scientists Daniel Mansfield and Norman Wildberger now confirms the markings on the tablet as a trigonometry table. After conducting a historiographical analysis of the tablet’s purported purpose, Mansfield and Wildberger took a closer look at the tablet and its inscriptions. Plimpton 322 features four columns and 15 rows of numbers written in the cuneiform script of the time. Importantly, this text is written in a base-60 numbering system, also known as a sexagesimal system (think of it like the minutes on an analog clock). Its 15 rows describe a sequence of 15 right-angle triangles, which are steadily decreasing in inclination. Also, the left-hand edge of the tablet is broken, meaning parts of Plimpton 322 are missing. Building on previous research, Mansfield and Wildberger were able to show that two columns and 23 rows are missing—the original tablet contained six columns and 38 rows. The tablet contains a special pattern of numbers known as Pythagorean triples (now an anachronism, given that Greek mathematician Pythagoras was born about 1,300 years later). This suggests that Plimpton 322 describes the shapes of right-angle triangles using a novel form of trigonometry based on ratios, rather than angles or circles. Thus, scribes could use the table to carry out the complex task of generating and sorting the numbers on the tablet; they could take one known ratio of the sides of a right-angle triangle to determine the other two unknown ratios. “It is a fascinating mathematical work that demonstrates undoubted genius,” exclaimed Mansfield in a statement. Crazily enough, Plimpton 322 is not just the oldest trig table, the researchers say it’s the most accurate trig table on record, on account of the ancient Babylonians’ unique base-60 approach to arithmetic and geometry (try dividing 1 by 3 and you’ll instantly run into the limitations of our base-10 system). And as noted, it’s also rewriting history; Greek astronomer Hipparchus, who lived around 120 BC, is normally considered the founding father of trigonometry. His “table of chords” on a circle was the oldest trig table, until now.